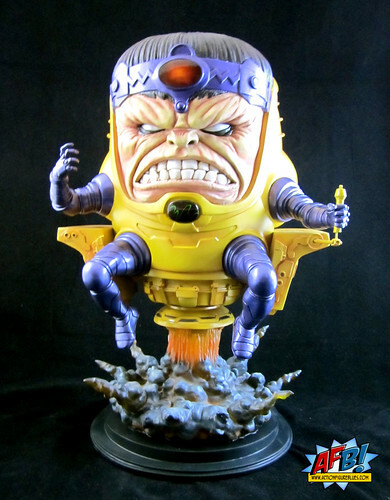 Bowen Designs and the Kucharek Bros pull out all the stops for M.O.D.O.K.! There are some pieces that I buy because I love the character, some that I buy to complete a team or set, and some that I buy simply because they look freaking amazing. Tonight’s review, subject, the Bowen Designs M.O.D.O.K. Full Size Statue, definitely falls into that last category. 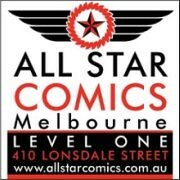 This piece was a Previews Exclusive - something I’m not entirely clear on the benefits of, since Previews is so accessible, either through your local comic store or favourite e-tailer. From what I’ve heard, many sellers had their orders of this great piece allocated, so I was very pleased that mine came through. I first came across M.O.D.O.K. in the pages of the original Official Handbook of the Marvel Universe, and as I was a tender lad of twelve or thirteen at the time, I remember being a tad frightened of him. Jack Kirby certainly had a mind for the bizarre, and he brought his A game when he and Stan Lee created this insanely strange villain. Bringing something as challenging as the Mental Organism Designed Only for Killing to statue form sounds like a job for none other than the amazing Kucharek Brothers, who always seem to be up for a design challenge. They have most certainly risen to the occasion! I could go on and on about the detailed sculpting on this amazing piece. The Kucharek Brothers have absolutely pulled all the stops on this one! 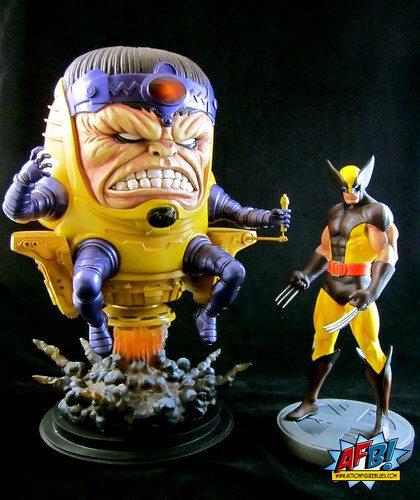 M.O.D.O.K.’s face is a real triumph. He has all of his trademark wrinkles and a perfectly evil facial expression. His teeth are huge and beautifully sculpted. He very much looks like he’s just leapt right off the pages of a classic Captain America comic. Around this fantastically sculpted face is body armor to die for - sculpturally (is that a word? It should be!) speaking, of course. There is a brilliant amount of detail in his headpiece, limbs, containment suit and amazingly cool chair. All of this is supported by a spotless paint job with perfect colour choices. The character and base are separate pieces here, and the assembly is a large peg and hole deal. The tube that the peg goes into looks infinitely breakable, so I was very careful when putting it all together. There is some nice use of translucent materials in the base to depict M.O.D.O.K.’s chair “blasting off” - both an energy blast and smoke. Apart from the great design, sculpting and paint, the other thing that makes this a breathtaking statue is its size. This thing is HUGE! I normally keep comparison pics for my Facebook photo albums, but I had to include one here by standing the well-known Bowen Wolverine statue next to this monster of a piece. Pulling off something like M.O.D.O.K. really makes me think that Bowen can do anything, and definitely makes me excited for their upcoming Professor X in Hoverchair Statue! Of course, if they produce too many more of these oversize pieces, I’m really going to struggle for display space - but, hey, when have I ever let that stop me? I still wonder to this day how this guy goes to the bathroom lol.